Tiger Woods gave his first two interviews since confirming his golfing return at The Masters in Augusta. (CNN) -- Tiger Woods' return to the the public domain gathered pace earlier this week with the release of two five minute interviews he gave to ESPN and the Golf Channel. 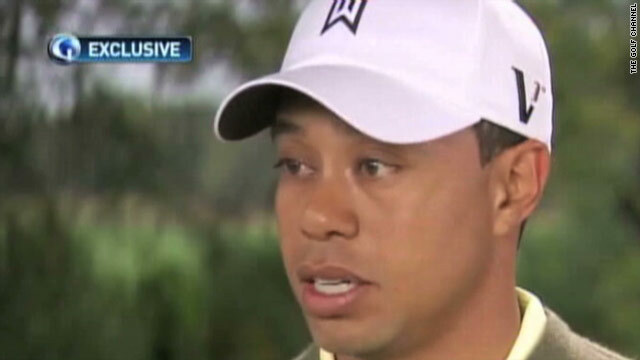 These were the first one-on-one soundbites that Woods, who will return to competitive action at next month's Masters in Augusta, has given since his press conference on February 19, where he read out a statement apologizing for his recent actions and acts of infidelity. Both ESPN's Tom Rinaldi and the Golf Channel's Kelly Tilghman were instructed that they could have a maximum of five minutes each to talk to Woods about his recent indiscretions -- although Tilghman managed to squeeze an extra minute's information from the world number one. CBS.com golf writer Steve Elling thought that five hours, rather than five minutes, was the right amount of time to quiz Woods. CBS turned down the chance to interview Woods, saying that five minutes was not long enough for them. Golfweek.com reported CBS spokeswoman LeslieAnne Wade as saying: "Depending on the specifics, we are interested in an extended interview without any restrictions on CBS." And Elling continued that theme, adding: "Given the staggering amount of news relating to Woods and his behavior over the past few years, which has all come to light since his solo car crash on Thanksgiving night, this was like giving a crouton to a starving man. It's not nearly enough." Wasington Post sports columnist Leonard Shapiro criticized the choice of Tilghman to interview Woods. "According to the Golf Channel's Web site biography of Tilghman, she has appeared as a voice on Woods' highly popular video games, Tiger Woods PGA Tour '09 and '10, produced by EA Sports, one of his main sponsors. Meanwhile, the New York Times' Richard Sandomir was slightly less critical of the interviews. "Tiger Woods did not say much that was new on Sunday night, but that does not matter. Whatever Woods does now is more interesting than it was before -- everything he says will be followed obsessively." However, Woods' interview brought a stining response from Daily Telegraph sports correspondent Oliver Brown, who, in response to Woods bemoaning the fact that he had quit "being a Buddhist", wrote: "Baring your soul to the nation is all very brave, but dignifying your dalliances as some failure of religious conviction most emphatically is not.